Please read over the contract, fill out your information on the below form and submit it to us. A consultant will contact you shortly. If you have not heard from a consultant within 24 hours after submitting this form, please call 303-980-1400 and ask for the Bridesmaid’s Department. 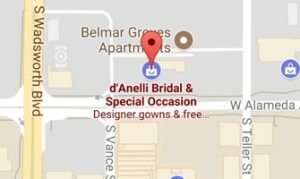 Because you are out of town, we strongly recommend that a professional seamstress, bridal consultant or a tailor take your measurements.